Want to impress your special someone with a date they will never forget? Many of the nightclubs in Las Vegas have more of a party vibe where you can’t necessarily mingle, but some clubs and lounges are perfect to get to know someone and socialize – while also having a memorable and fun night. The first best club to bring your date would be Apex. This spectacular club offers not only a 360° view of Sin City at night, but also provides a dance floor and an outside patio that has an ideal amount of mingling space. 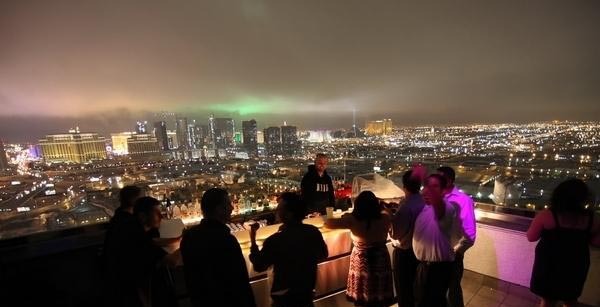 You and your date can grab a drink, admire the unique view of Las Vegas from 55 stories high atop the Palms, and then hop on the dance floor to show off your best moves and amaze your date. Our guest list gets Ladies in free and a free drink. So take your date to one of the most phenomenal venues in Las Vegas to sight-see, drink, and dance! Second greatest place in Vegas to take your date would be The Foundation Room at Mandalay Bay! Located on the 44th floor of Mandalay Bay, this lounge with its sophisticated decor is always thriving. You and your date can grab a drink from one of many elegant bars and take a seat at one of the most luxurious lounges in Las Vegas. Join the city’s elite in this exclusive club that is eloquently decorated with artifacts and exotic interior. Our guest list gets Ladies and Gents in free, and Ladies free Champagne Fridays and Saturdays, and a free shot on Sundays.